This product is a clock housing. The customer does not have any special requests of the product and material function but high gloss surface. We suggested him use polycarbonate PC/ABS, which is the ideal best and the most classic engineering thermoplastic. Melton PC/ABS has excellent low temperature toughness, and easy to processing. Most of consumer products on the market are made by PC/ABS. 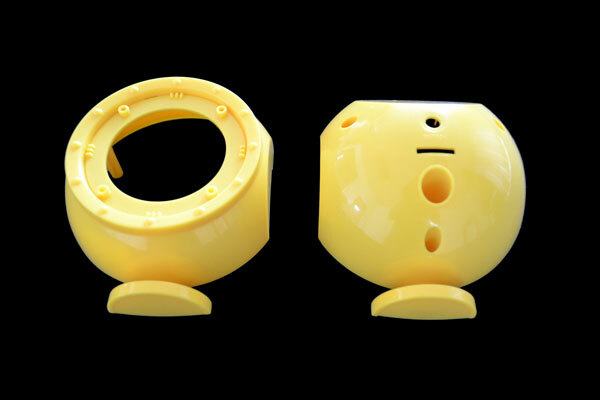 Considering the production efficiency and saving cost, the front and back components were designed in a same mold that so called family mold. All injected parts can be molded at once in a family mold. Surface treatment can be done when the mold is made. Surface finish we followed the standard of SPI-A2 which is Grade #6, 3000 Grit Diamond Buff, it makes the product surface looks shiny smooth. To achieve the requirement on the product surface, actually the mold tool have to be hard enough to endure such a long time machining. NAK80 Steel is a good choice for mold making. Tool life is up to 100,000 shots. Start your project from here. Get in touch with us and we would help you with your project.